This page contains some of our mailbag of correspondence with those who choose to communicate with us. The items below are our dialogs or responses to various letters and emails on topics which SDA members may disagree with us or just wish to chat about. Hopefully these letters can give you some better understanding on our perspective, and perhaps see what the Scriptures teach on various topics. If you communicate to us and we elect to use your correspondence in our mailbag, we will not use your full name nor your email address with out your permission first. Rick, it was joy and delight to meet you and your sweet wife and have such a fruitful discussion and we thank you for the brownies. My heart is broken however by many of the basic and historical teachings of the SDA church. The most distressing doctrine to me personally is that which assigns the final atonement for sin to be borne by Satan himself and not the final atonement which took place on the cross by the death of our beloved Savior. (EGW of course taught in many places that the atonement was not finished by Jesus on the cross). You of course, are fully aware of all those Scriptures which tell us in no uncertain terms, that the entire responsibility for atonement, cleansing, and finality of forgiveness of sin was entirely and solely upon the Savior himself. Historically, and beginning with EGW and reiterated by ALL the SDA church leadership and writers right through the present is the teaching that Satan is the final sin bearer of the believer who suffers the burden of the punishment not only for his own sin, but that of the believer as well. The church fathers nor church history nor Scripture knows nothing of such teaching. My heart is broken when others teach that Jesus is not the "Lamb of God, who takes away the sin of the world".......and as Peter said....."He Himself bore our sins in His own body on the tree....." and as Isaiah wrote......"He was wounded for our transgressions and He was wounded for our iniquities......and God has laid on Him the iniquity of us all." As you read the history of the SDA, many have tried to avoid, explain away, make excuses for and outright deny such a well established teaching as Satan being the scapegoat and final sin bearer, but it remains as basic Adventist truth. Literally, thousands of SDA members and uncountable hundreds of pastors have left the church because of the many and overt conflicts between the distinctives of SDA doctrines and their direct conflict with Scriptures. The Great Controversy pg. 422 It was seen, also, that while the sin offering pointed to Christ as a sacrifice, and the high priest represented Christ as a mediator, the scapegoat typified Satan, the author of sin, upon whom the sins of the truly penitent will finally be placed. When the high priest, by virtue of the blood of the sin offering, removed the sins from the sanctuary, he placed them upon the scapegoat. When Christ, by virtue of His own blood, removes the sins of His people from the heavenly sanctuary at the close of his ministration, he will place them upon Satan, who, in the execution of the judgment, must bear the final penalty. The scapegoat was sent away into a land not inhabited, never to come again into the congregation of Israel. So will Satan be forever banished from the presence of God and His people, and he will be blotted from existence in the final destruction of sin and sinners. In Patriarch and Prophets pg. 358 EGW teaches clearly that Satan bears the "final penalty" for sin. Even Jesus Himself said as He died, "It is finished" (lit. paid in full). And on pg. 485 of The Great Controversy EGW wrote that ..."sins are transferred to Satan....who pays the full penalty of sin." Do you understand better now why our hearts are broken by what official SDA doctrine teaches. I have quoted only several of the multitude of EGW's writings which teach this awful doctrine over and over and with irrefutable clarity. If what I have said and other Bible believers have said is accurately understood, then somebody is a false teacher. And false teachers are to be repudiated. Brian and I have heard too many excuses made for EGW such as, "well she is only human and can make mistakes." Whenever does the Scripture allow us to excuse false teaching as "just a mistake." This is a woman who called herself "more than a prophet" and whom the SDA church calls "a continuing and authoritative source of truth." My dear friends, please be a Berean in your thinking as in Acts 17:11 where even the teaching of the Apostle Paul was called into question to determine whether or not it lined up with Scripture. Again, You don't have to agree of course. I do agree with the case that they make, I think they make a very cogent case on the scapegoat, and you yourself, from what you said yesterday, it seems like you also believe that the scapegoat is not representative of Christ as some believe, which is where their sanctuary doctrine breaks down since it doesn't Type very well with the Antitype of what we see that happened in the New Testament. The only way that I can see it all be reconciled (ie the sanctuary ritual that God gave to His people and what it was pointing towards) is what they explain in the above two links. Rick, Type or Shadow as used in the New Testament must be justified by the text of the New Testament. If it is not, then any wild interpretation is possible and we can say the Scripture becomes a matter of "private interpretation. eg: The bells on the bottom of the priests robe are a type or shadow of the music the believer will hear when he enters into the holy tabernacle of heaven. What nonsense. Scripture interprets Scripture. Not once in either OT or NT is Satan ever equated with the scape goat. Not even once did the writers of the NT ever hint at such a connection, nor the Church Fathers, nor the theologians of the historical Church. Type and shadow is spoken of specifically the NT writers from OT examples usually of Christs work on the cross or of the Tabernacle picturing His work of salvation on our behalf. Never is the scape goat presented as the final bearer of man's sin. We are speaking of a "Faith once and for all delivered to the saints" which was added to in the mid 1850s by EGW. This is a major revelation and reinterpretation of what the Church had always taught and believed. The work of Christ was finished at the cross and Satan was judged there and headed for the lake of fire prepared for the Devil and his angels. This is not a minor doctrine. How do we excuse and explain such a thing? Not once is in the NT is it ever said that Jesus did not make full and final His work of atonement on the cross. Clearly the transaction of the cross is considered final and without probation or condition. Never once is there a mention of the sins of the believer being transferred from the cross to the Sanctuary and then ultimately to Satan who "bears the final penalty." The argument for Satan as Scapegoat and sinbearer as taught by EGW said clearly in the GC that "Satan bears the final penalty for sin," Am I confused about the clear meaning of language especially as written by EGW and repeated literally thousands of times in that exact context by Church writers? Rick, this is what the Bible calls the doctrine of demons. Dear Marilyn, I have been thinking very carefully about what you wrote in your last email and praying about how to answer you. In a careful reading of your letter, I see many statements and phrases which lead me to think that you have a measure of uncertainty and insecurity in what the Scripture says when taken at face value. Can we afford to reject or question those things which are plainly and repeatedly presented and by careful consideration, those teachings which Christians have believed and accepted for 2,000 years? If we decide to do so, the burden is really on us, isn’t it, to decide why a certain view is not acceptable or that God has been unclear. May I suggest that the fault is not in the text itself. The Hebrew of the Old Testament and the Greek of the New Testament, are essentially as they were during the life and ministry of Jesus and the Apostles. God has truly preserved His Word to us and for us. The following are some of my concerns about where you might be in your thinking about the message of the Scriptures. After we have looked at some of those statements of yours, we will take one particular doctrine which seems to be giving you some difficulty, and look at that in more detail. The following are some excerpts I gleaned from a careful reading of your letter. Absolutely God wants us to question what He means by what He says, and as Paul says, “to make our calling and election sure.” Even Acts 17:11 shows clearly that the Berean Christians put Paul’s preaching to the test to see if it was in line with what God had already recorded in the Scriptures. However, my feelings, my opinions, my thoughts, my ideas, my doubts and even my certainties, as the Bible clearly says, are to be subject to message of God’s love letter, the Bible. I admire your willingness to question and to seek for the real meaning of what God has said. For the most part, you can be certain, if you decide to decide that God meant what He said, and said what He meant. My feelings, my opinions, my interpretations and my like or dislike of what the Bible plainly says should never be the measure of what God means by what He says. The plain message of Scripture, from beginning to end, as all believers agree, is that God is Holy, Righteous, and Just and that He is far greater than the sum of all His attributes. So to understand the God of the Bible we must understand that He is absolutely sovereign in His universe and nothing is outside of His care, custody, or control. He is all powerful, all knowing, and everywhere. Nothing happens or may happen without His sovereign permission or determination in advance. God puts nothing to a vote, nor does He ask the permission of anyone nor does He seek approval after He is finished. There can be no greater comfort than knowing nothing is outside his sphere of influence and control. 14 What shall we say then? There is no injustice with God, is there? May it never be! 15 For He says to Moses, "I WILL HAVE MERCY ON WHOM I HAVE MERCY, AND I WILL HAVE COMPASSION ON WHOM I HAVE COMPASSION." 16 So then it does not depend on the man who wills or the man who runs, but on God who has mercy. 17 For the Scripture says to Pharaoh, "FOR THIS VERY PURPOSE I RAISED YOU UP, TO DEMONSTRATE MY POWER IN YOU, AND THAT MY NAME MIGHT BE PROCLAIMED THROUGHOUT THE WHOLE EARTH." 18 So then He has mercy on whom He desires, and He hardens whom He desires. In Jude 4 and in 2Peter 2:1, Jesus is called in the original Greek of the New Testament, (despotes) or a despot. Absolute sovereign ruler and in control, with no patience for disobedience to His will. On careful reading, the Scripture presents the Lord Jesus as a benevolent dictator. He always does what is right and for His own good, praise, and glory, and not necessarily for ours. Yet in Romans 8:28 it also says, “He works all things for the good of those who are called, and called according to His purpose.” Many disapprove of this picture of God in Scripture, but the Bible presents this picture of God without apology. And He does take care of His own sheep absolutely. I realize that you are struggling in the acceptance of how or whether God can and does send people to eternal punishment in “hell” forever and without end. Many struggle with the same idea, especially those with your own background in the Seventh Day Adventist Church. But such a view comes from an incomplete picture of who God is, what He is like, and what He is doing. Many don’t fully understand God’s justice and just how lost and undeserving man is in his total depravity. The same adjective used to describe punishment and life is identical;eternal meaning w ithout end and without termination either in quality and quantity. If the condition of men in both states is not the same, why didn’t Jesus say so. He should have said that one really is forever and the other is simply temporary and in the end God will obliterate the lost and put them out of their misery, but He didn’t do so and neither do writers of Scripture. 9 Then another angel, a third one, followed them, saying with a loud voice, "If anyone worships the beast and his image, and receives a mark on his forehead or on his hand, 10 he also will drink of the wine of the wrath of God, which is mixed in full strength in the cup of His anger; and he will be tormented with fire and brimstone in the presence of the holy angels and in the presence of the Lamb. 11 "And the smoke of their torment goes up forever and ever; they have no rest day and night, those who worship the beast and his image, and whoever receives the mark of his name." The judgment of the lost is interminable, as so the heavenly reward of the righteous. The same word again used to speak of the unending torment, is the same word use in the rest of the New Testament to describe the unending state of eternity with God. “ For after all it is only just for God to repay with affliction those who afflict you, 7 and to give relief to you who are afflicted and to us as well when the Lord Jesus will be revealed from heaven with His mighty angels in flaming fire, 8 dealing out retribution to those who do not know God and to those who do not obey the gospel of our Lord Jesus. 9 These will pay the penalty of eternal destruction, away from the presence of the Lord and from the glory of His power, 10 when He comes to be glorified in His saints on that day, and to be marveled at among all who have believed — for our testimony to you was believed. 14 The sky was split apart like a scroll when it is rolled up, and every mountain and island were moved out of their places. 15 Then the kings of the earth and the great men and the commanders and the rich and the strong and every slave and free man hid themselves in the caves and among the rocks of the mountains; 16 and they said to the mountains and to the rocks, "Fall on us and hide us from the presence of Him who sits on the throne, and from the wrath of the Lamb; 17 for the great day of their wrath has come, and who is able to stand?" Ironically, the Greek word for unquenchable is asbestos. That gives us a picture of being in the middle of the conflagration and yet not consumed. These words are serious and well as unpopular, but they are God’s words to us through His prophets. May we take them at face value and be motivated and changed and challenged by them to take God seriously. For if you can’t take God seriously, whom can you take seriously? I am praying for you that the eyes of your understanding may be opened to the fact that God said what He meant and meant what He said. Marilyn, Jesus said: “My sheep hear my voice” and you seem to be having trouble hearing “His voice”. That is a very big warning flag that you need to bow down before Jesus as the all sufficient Savior and turn from you sin and recognize and confess Jesus as Lord, or you yourself are in danger of Hell fire. Bob's Letter to Brian on his indifference of sharing the Gospel. Dear Brian, I haven't heard from you in a long time. Wondering how you are doing and what you are thinking. I still wish that you would show me from God's Word why I am wrong about what the Lord Jesus has done for us and how I can assurance of Eternal Life and sins forgiven. But actually your refusal and at the least , neglect, to dialogue with me about salvation is completely typical of the hundreds of Adventist leaders and members to whom I have appealed. 100% will not discuss the doctrinal distinctives of the Church nor how I could personally know that my sins are forgiven and I am safe in the arms of Jesus forever, as Jesus says. Recently, a committee of the top theologians of the SDA Church finished meeting and discussing for over 5 years without being able to agree upon and settle the issue Biblically, the Investigative Judgment. So if the top men of the Church can't figure out the basis for the central doctrine, I probably should not expect more from a mere laymen. According to the Church website, over 300,000 per year are leaving the Church. Of the dozens of Churches we have visited and the scores of events, there are virtually no young people seen in attendance. All of our surveys conducted at college campuses tell us that these students can hardly wait to graduate and leave the Church. In fact at Walla Walla, there is an entire alternative to the Church on Campus which is more open and Biblical and the administration must tolerate it or the students said they would leave school. Why are most of the congregations filled with people who have either blue hair or no hair? Most churches, just to exist, must rent to or from mark of the beast churches , just to survive financially. Most churches must share their pastor with at least one other church. Why is this happening to the only true remnant Church of the last days? Hundreds of pastors leave the Church every year. Most who move on in the faith to the Biblical view say they can no longer justify that the central doctrine of the Church finds any place in Scripture and in fact they found it to be anti-Biblical. Of course we speak of the Investigative Judgment. Others say they struggled for years because of financial concerns long after they came to understand the grace of God in the Gospel. They would lose their pension for which they worked their whole life and they would be shunned, like others they knew. Praise God that so many have had the courage to trust God through faith alone, by grace alone, in Christ alone and in the Scriptures alone. Are you afraid of the consequences or is God greater than all our fears and doubts? Perhaps I am not worth speaking to and delivering from the kingdom of darkness, because the worst that can happen to me by SDA standards is obliteration and to be annihilated. So in reality, there is no pressing need to present the Gospel to others because there are no real eternal consequences in not believing and fact, no absolute assurances in believing because Jesus will not reveal the results of His Investigative Judgment until it is too late to do anything about being wrong or lost. As strange as it seems, every single technical term Jesus used to speak of Eternal life, He use to speak of Eternal death. But if I were an Adventist who believed in conditional life rather than eternal life, I wouldn't be highly motivated to share my faith either. So perhaps I do understand after all. Maybe I should believe in Horton the Elephant instead. "I meant what I said, and I said what I meant. An elephant's faithful 100%". Perhaps Jesus was using double speak or hyperbole , when He said in John 10, that "you will not ever perish" and in John 5 that "you will never come into Judgment". And at least I can believe in Horton. He was clear. Is there is nothing I can say or do that would make me worthy of your time or concern? If a man such as yourself, who makes his living working for the Church, won't help me escape from error and the kingdom of darkness, perhaps it is too much to expect from the average church member. Bob has a request to Brian. Brian my friend, I have noted that you have stopped corresponding or responding to my emails. Again, I politely ask you to help me to know the Truth as you do, especially if my soul is in danger of eternal separation from God. It must have become obvious by now that believing Christians who have only the Bible And not the 1000,000 pages of EGW) have a different Jesus than the Jesus of Adventism. Both of us would agree that if we have the "wrong Jesus", we also have "another Gospel". Jesus cannot be both created and uncreated; a Savior who has finished His work on the cross, and a Savior who has not finished His work on the cross; He cannot be both an Angel and not an Angel; He cannot both keep His children safe in salvation and unsafe in salvation; He cannot be both God from all eternity, and an angel whom "God raised to equality with Himself." I think that both of us believe that two opposite and contradictory theological statement cannot be true at the same time. So which do I take? My eternity depends on my understanding and decision.Ellen White (whom the Church says is a continuing and authoritative source of truth) that......"when the judgment of the General Conference, which is the highest authority that God has upon the earth, is exercised, private independence and private judgment must not be maintained, but surrendered." Testimonies For The Church, vol. 3 p. 492 This appears that the thinking has been done for me by the organization. Does this sound a bit cultic to you? It does to me. Even the Bereans questioned the Apostle Paul to confirm that what he said compared to the Biblical standard which God had previously revealed. Acts 17:11 "These were more noble minded than those in Thessalonica, in that they searched the Scriptures daily, to see if those things (Paul's teachings) were so." They never hung their brains by the door when they became Christians. I read your first email, but got stuck at an early point where you quote Hebrews 10:19-20 and then comment: “Therefore, brethren, since we have confidence to enter the holy place by the blood of Jesus, by a new and living way which He inaugurated for us through the veil, that is, His flesh” (Heb 10:19-20 NASU). The same word in the original language for “veil” is used in both passages and is a technical term referring to the inner veil of the temple separating the two compartments. Something didn't sound quite right, so I went back to the LXX (and discovered that the versification in the LXX and our English version which are based on the Hebrew are different in parts of Exodus. Not important, but it was confusing and took some time to sort out.) I also read the following article—http://www.auss.info/auss_publication_file.php?pub_id=747&journal=1&type=pdf which confirmed my initial study of καταπέτασμα (that it is not a technical term referring to only the inner veil.) A few of the Lexicons I have that are not Adventist also confirm this. Not much to show for 3 hours. Company is coming soon. Hopefully this evening I can look at Hebrews 10:19-20. BrianPS Looking like another beautiful day. Hope you are some place where you can enjoy the nice weather. Brian, I can see you are doing some thinking. Katapatasmatos when used in the New Testament refers only to the inner veil of the temple or tabernacle.and is the primary word used in the LXX for the same. In fact, as far as I can discover, there is no mention directly of the outer veil in the New Testament nor a word for it. Of course, the issue in Hebrews is that Jesus went immediately into the Heavenly Holy of Holies to be at the Father's right hand at His ascension to heaven. And because the veil in the earthly temple was torn from top to bottom at his death, there was no longer a barrier between a holy God and a sinful man because Jesus dealt permanently with the sin problem. As a result, the Biblical argument says that believers can safely go into and remain in God's holy presence because they have a personal representative in Jesus who is a priest forever, after the order of Melchisadek. His very flesh is spoken of as the "torn veil" allowing us and Him to be forever in God's holy presence. As far as I can determine in the LXX, the only word used to describe the inner veil is Katapatasmatos though it is used to speak of other applications. The issue really is of course, how is it used in context in the New Testament and in Hebrews. Several instances I have found in the LXX where it is abundantly clear that the word is used of the inner veil is Ex. 26:31 and Lev. 21:23. Regardless of whether one believes and accepts that is a technical term or not, it is always used to speak of the inner veil in the New Testament and it is the word mostly used (as admitted by Dr. Rice) to speak of the inner veil in the LXX. I cannot find a single use of a term or reference to the "outer" veil in the New Testament. As you are fully aware, the lexicon is not the final authority of determining the meaning of a word, but context is king in this case. The lexicon gives us the syntactical and etymological basis and all the possible options. The overwhelming conclusion for the use of our word in Hebrews is that which refers to the inner curtain. In Heb. 6:19-20, we have a "hope that reaches within (or inside and behind the curtain). This is the place of ministry of our great High Priest Jesus. If He is not the one who is now there permanently at His ascension, the New Covenant has no meaning and there is not a "better way" replacing the failed Old Covenant. As it says, He now has a "better" ministry that the O.T. priesthood. The writer from Andrews University Geo. E. Rice to whom you referred agrees fully with this view as well as with all the Greek lexical experts he cites. He then contradicts his own conclusions by turning certainly into contingency because the prima facia view is that Jesus went to the Father's right hand at His ascension. This view is then thrown into doubt because it doesn't agree with the SDAtheology that Jesus never made it to the Holy Place until October 22, 1844 and most certainly did not take believers with Him because those who are dead have ceased to exist and won't be reconstructed until the resurrection. I think he is saying that there must be another view, because this one does not agree with my theology. Could it really be such bad news after all that Jesus really did go immediately to the Father's right hand at His ascension? Is it really bad news that He takes believers with Him into the safety and security of God's eternal presence before the Father and "seats us together with Him?" Every lexical scholar cited by your Adventist author agrees with the Biblical view that the veil spoken of in Hebrews is the inner curtain, otherwise, even the context of the passages makes no sense whatsoever. Otto Michel, BF Westcott, James Moffatt, L enski, Ellinsworth and Nida, GW Buchanan and including all the lexical works in my own library support the view which I am supporting. All the writings of the early fathers and theologians never mentioned a two compartment ministry of the Lord Jesus Christ who moved from one place to another. How did the SDAs come up with this view which is not even mentioned until 1844 and not ever mentioned on the pages of the New Testament. I thought that "the faith was once and for all delivered unto the saints". May 28, 2014 -- Sabbath Issues: a three way discussion on the Sabbath between Bob Koivisto, Rolph and Fred S. Hosillos. >who made it. Do not place God on the same level as man. God is infinite. >thing away from it. Jesus said the same thing (Matthew 5: 17 - 20). >finger and on his heart with your love. Bob you cannot fight the truth. >know it because it is there. Any thing else is the commandment of man. >conversation without taking care and examining every single word or phrase. >in the classical Biblical view. >examples, penalties or benefits spoken to the Church about Sabbath keeping. >the final rest of salvation in Christ and that He is our Rest. >in the NT for the person who keeps it or doesn't keep it. >Covenant and the Grace of God in the Gospel. >right" day to worship God, and has the "last- day prophet"?! >Sabbath, because in Him alone we find PERFECT REST from sin! March 27, 2014 -- A response from Brian to Bob K.
Thank you for your email. Please review the context again. I think it is safe to say that First Corinthians 3:10-15 is not the context for Second Corinthians 5:10. The comment that "Our works during this lifetime have no effect on the quality or condition of our salvation" is fatally dangerous and of all the things you have ever said to me is the most scary. I humbly urge you to re-read the Bible again and not cling to Calvinistic notions for salvation. 1 Peter 3:15 And account that the longsuffering of our Lord is salvation; even as our beloved brother Paul also according to the wisdom given unto him hath written unto you; 16 As also in all his epistles, speaking in them of these things; in which are some things hard to be understood, which they that are unlearned and unstable wrest, as they do also the other scriptures, unto their own destruction. 17 Ye therefore, beloved, seeing ye know these things before, beware lest ye also, being led away with the error of the wicked, fall from your own stedfastness. 18 But grow in grace, and in the knowledge of our Lord and Saviour Jesus Christ. To him be glory both now and for ever. Amen. The New Covenant is when God writes His commandments in the hearts of believers. How can you claim to believe in the new covenant and yet worship on a day of Papal origin? So much could be said.... Yet a willingness to explore what the Bible teaches and surrender any pet theories as necessary seems to be a good first step in understanding. Since what you have said in the past about the Sabbath goes against the commandment "remember the Sabbath day to keep it holy" and since your statement "Our works during this lifetime have no effect on the quality or condition of our salvation" goes against the testimony of Christ and the apostles, I must conclude that there is no light in you. Brian, I have looked carefully at the Dr. Hasel's paper on judgment. I have come to several conclusions. 1. He is completely ignorant of the promises and conditions of the New Covenant. (Jer. 31, Heb. 8,10) 2. He thoroughly misrepresents the context of John 5 and what Jesus said about judgment.3. He confuses temporal judgment with the final judgment. 4. He does not look at the context of 1st John 1:9 as a way for believer's to maintain fellowship with God, and not as a way to be re-saved.5. He does not see clearly that no believers' are disqualified or condemned at the "judgment seat of Christ" and the description of the "bema seat" judgment in I Cor. 3 says that in spite of the fire which will test a believers' works, he may suffer loss as useless works are burned up but he himself will be saved, "so as through fire." 6. He ignores the plain teaching of Scripture that Salvation is described as a present possession and that it is "once for all". This Greek word for finality and an event not to be repeated either by the Savior or by us is used over and over in Scripture without condition or hedging. 7. How many of our sins were future when Christ died on the cross? All of them, not just the sins we have committed up until we are saved as EGW teaches. 1 Jn. 5:11-12 cannot be true that one KNOWS he has eternal life if he has the Son of God if this professor is correct. How can one know anything about salvation personally or otherwise. Nothing of what Jesus or Apostles said about eternal life can be true, especially that it is ETERNAL. if Jesus Himself may not know because we may have not as yet undergone "the searching scrutiny of His Investigative Judgment to see if we are worthy of eternal life", how can we possibly speak about our personal salvation and forgiveness with any confidence or assurance whatsoever? EGW used the word PROBATION over a thousand times in her writings when speaking of believers, and the writers of Scripture never used it once. Why do you suppose that is? Did she know something about which they were being both deceitful and neglectful? I think not. This kind of religion is a hope without substance, assurance, and reality. The reason these simple Biblical truths are not clear to you is found in the words of Jesus in John 3: "Unless a man is born again, he can't see the kingdom of God", Again in I Cor. 2:14, "The unbeliever does not receive the things of the Spirit of God, neither can he know them, because they are spiritually discerned." And one more :But to this very day, whenever Moses is read, a veil remains over their minds, but when they turn to the Lord, the veil is removed." I am writing these things because I love you and don't intend to be harsh nor insensitive, and care deeply about your eternal destiny and desire your eyes to be open to the genuine Lord Jesus Christ. We cannot both be right about the Lord Jesus and His work on our behalf and the nature of our salvation. If I am wrong, prove it to me. It is very dangerous to be wrong about God, and it is not possible that we can both be right with such facts in obvious contradiction. Feb.27, 2014 -- Investigative Judgement Issue. >>> done, or the Son who is still trying to figure it out? >> the primary foundational principles to our understanding. >when Jesus Himself may not even be finished with judging you for your past? >continuing results into the present. How can something be given to the Son such as “an exalted position” if He indeed was always fully equal with the Father in His deity? A literal translation of John 1:1 shows that Jesus always was deity. His purposes, but would do nothing of himself alone. This seems to imply that after the angels were created, they did not know or recognize that Christ was equal with the Father and it took a special "heavenly council" to inform them of this. Nevertheless, these kinds of statements are used today to support the semi-Arian position that some Adventists have recently begun to advocate. Could it be that these passages express Ellen White's understanding of Christ's position in heaven at that time and that as time progressed, she received more light, which eventually led to her very clear Trinitarian statements in the late 1890s?" The early Ellen G. White seems to have been in harmony with her associates who did not believe in the Trinity. The Anti-Trinitarian Adventists today try to carry her early concepts through to the end of her life. I see a clear reversal in her thinking so that later in life she moved from being a non-Trinitarian to being a true Trinitarian. The dissidents try to marry the old Ellen G. White concepts with her later ones as though there was development but no real change. However, as we shall yet see there was considerable change many of her old concepts were left far behind. Even the leading Adventist theologian (I have listened to hours of his lectures), says that Ellen White grew in her understanding of the Trinity over the years and later recognized the full deity of The Lord Jesus Christ. Since the bulk of her writings were composed during the first 50 years when she was wrong about who the LJC was, how can she be trusted about anything she says? If you are wrong about the nature of God and the true identity of His Son, why are you not mislead, uniformed, and false? This really is a big issue. All of the apostles wrote that those who are wrong about who God are to be considered liars and false teachers. When did any of the prophets in Scripture need to grow in their understanding between and true and false view of who God is? Of course they grew in their deeper understanding of God as do we, but never did they grow from a false view to a true view. It is often ascribed to EGW that she had progressive revelation, but progressive revelations never anywhere in Scripture grows from truth to error nor from error to truth. 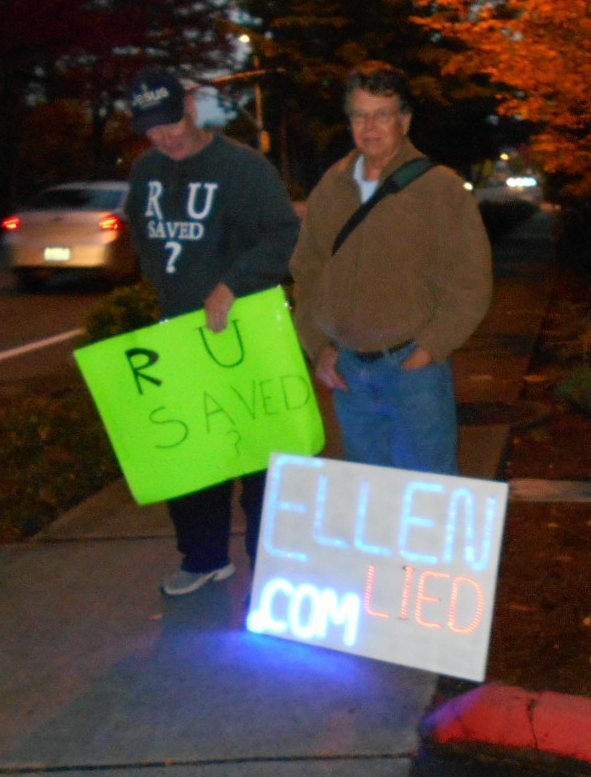 Dec.13--2013 "Christmas Display and www.ellenlied.com"
Aug.13 --2013 "Not Every one likes us"! Why is it when I asked for a flyer your member refused to give me one? So I went to your web site to ask a question. Looking at your info does nothing but inflict conflict. Your members are so unhappy that they try to bring others into your misery, The saying misery likes company. Must go along way with the likes of you folk. BY picketing camp meeting this past weekend is nothing less then revolting. The Sabbath is suppose to be a day a rest, a blessing, a day to enjoy our Creators hand work. Instead we have to push our way past a group of mindless folk protesting our belief. If your unhappy with yourself and our belief why shove your discontent in our faces. I said to your member when he refused to give me your info I asked him if he was an unhappy camper? His reply shouting at me your an unhappy camper. To say I was pretty fed up with protesting signs and mindless morons would be the truth. I hope you have a miserable time holding useless signs.